Join us for the World Day Against Foie-Gras! This November 25th is the World Day Against Foie Gras. This day will send a resounding message of our vigorous and determined opposition to the torture of force-feeding ducks and geese. Please add your voice to our day of protest! 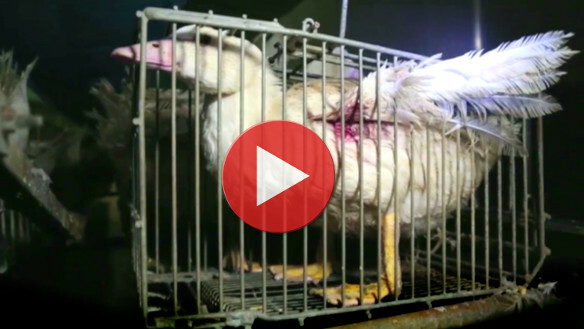 Foie gras: The European Commission turns a blind eye to French law-breakers! For several years now, L214 has regularly informed the European Commission of the ways that the French and the other foie gras producing countries deliberately ignore the European laws concerning Animal welfare. More : Foie gras: The European Commission turns a blind eye to French law-breakers! L214 reveals a behind-the-scenes investigation carried out at the firm Ernest Soulard, which supplies foie gras to world-famous starred restaurants and the most renowned luxury hotels in the French capital, including Fouquet's, George V, the Royal Monceau, the Atelier de Joël Robuchon, the Jules Verne and the Meurice (Alain Ducasse), Lenotre and the Grande Brasserie FLO, and other high-end restaurants worldwide. Foie gras soon to be banned in Europe? The citizens and groups supporting the Manifesto for the abolition of foie gras call attention to the unescapable ban of force-feeding -hence, of foie gras production. "No animal shall be provided with food or liquid in a manner (…) which may cause unnecessary suffering or injury." Council Directive 98/58/EC of 20 July 1998. "Methods of feeding and feed additives which cause distress, injury or disease to the ducks [and geese] or may result in development of physical or physiological conditions detrimental to their health and welfare shall not be permitted." European Recommendations concerning ducks and geese used for the production of foie gras of 22 June 1999. Foie gras is the pathological liver of a bird suffering from hepatic steatosis. European Commission Scientific report of 16 December 1998. Diarrhoea, panting, walking difficulties, lesions and inflammations of the neck are daily realities. Force-feeding has already been banned in most European Union countries. It has been banned since January 1, 1999 in Poland. It has just been banned in Italy, Israel and California on grounds of cruelty. In Chicago selling foie gras, including in restaurants, has just been banned on same grounds. Foie gras violates the principles of the European Convention for the protection of animals kept for farming purposes. Citizens' Initiative for the banning of force-feeding. Un problème sur le site ? Contacter le webmaster !